This Safavieh Adirondack area rug is sure to make a statement in any room of your modern home. Decor does not have to be hard with this plush polypropylene indoor rug. A durable product is assured with this machine-made rug. Keep things classy, yet high-quality with this geometric patterned silver rug. Place this Safavieh Adirondack area rug in your dining room when you need a splash of style. Designed for your hallway, dining room, or living room, this indoor piece made from plush polypropylene material looks and feels great. A durable product is assured with this machine-made rug. Quality and style come first with this chevron patterned off-white rug. Modern and stylish, this Safavieh Adirondack area rug is a quality accent piece. Made from plush polypropylene material, this indoor rug is high quality and extremely fashionable. High-quality and high fashion, this machine-made rug is perfect for you. This off-white rug with its chevron pattern is modern and stylish. Interior design made simple with this contemporary Safavieh Adirondack area rug. Keep it classy, quality, and stylish with this indoor rug made from plush polypropylene material. The machine-made construction of this area rug is both modern and comfortable. The chevron pattern on this off-white rug is very modern and stylish. 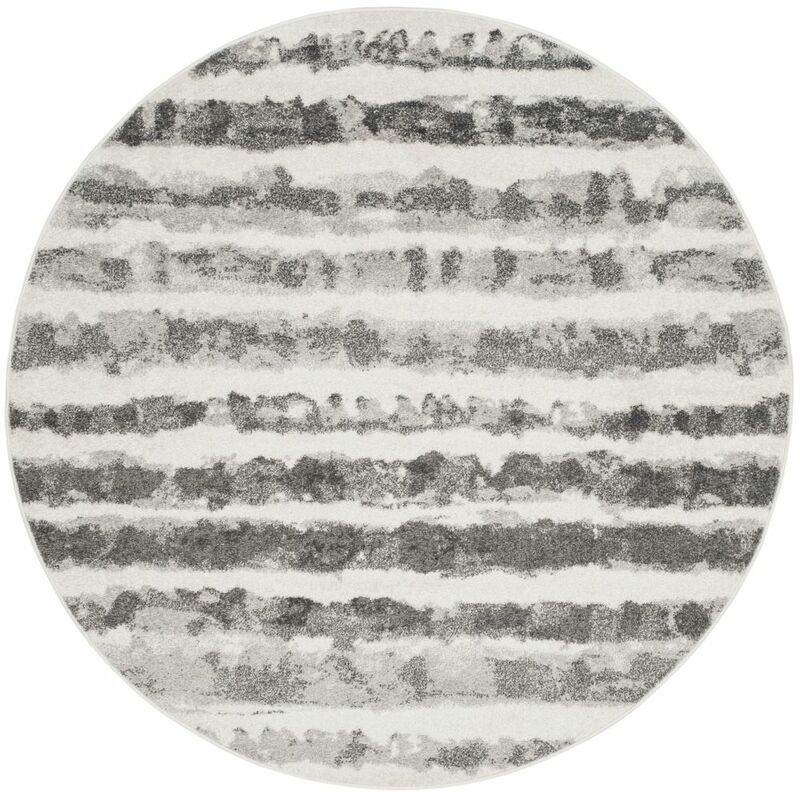 Adirondack Callista Ivory / Charcoal 6 ft. x 6 ft. Indoor Round Area Rug Inspired by global travel and the bold, colourful motifs adorning fashionable ski chalets, Safavieh translates rustic lodge style into the supremely chic and easy-care Adirondack collection. Crafted of enhanced polypropylene yarns, Adirondack rugs explore stylish over-dye and antiqued looks, making striking fashion statements in any room. This collection is power loomed in Turkey. This is a great addition to your home whether in the country side or busy city.